Blackmagic Design has a history of acquiring high-end sophisticated post production software, releasing a free version or a pro version for a reasonable cost, and then continuing to develop the software with major updates packed with great new features. 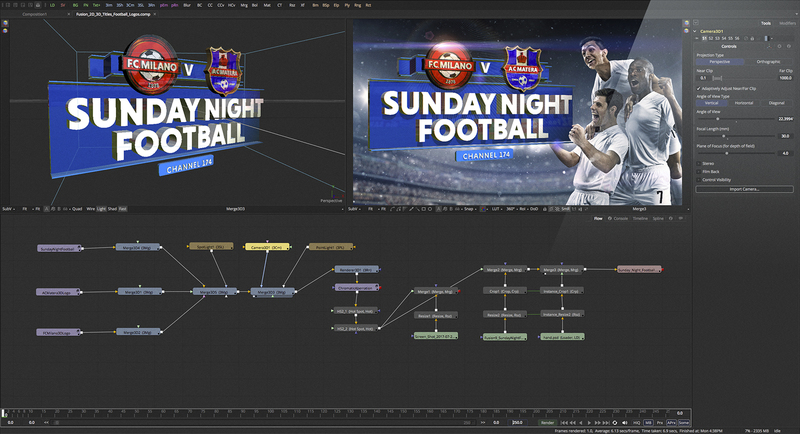 This was the case with DaVinci Resolve and continues with Fusion, a powerful node based compositing, visual effects, 3D and motion graphics application (previously published by Eyeon Software). Now, to coincide with SIGGRAPH 2017, Blackmagic has just announced Fusion 9, a major update to the software which features new VR tools, new keying technology, planar tracking, camera tracking, multi user collaboration and more, and its available today. Fusion 9’s VR toolset gives users a full 360 degree 3D workspace which has a new panoramic viewer and support for popular VR headsets such as Oculus Rift and HTC Vive. This allows for a completely interactive VR working environment that is accelerated by the GPU so that users can wear a headset and interact with elements in a VR scene in real time. Now, that sounds very cool. In addition, Fusion 9 also supports stereoscopic VR and has a new 360 degree spherical camera that can render out complete VR scenes. Fusion 9 now includes a new planar tracker in Fusion 9 which calculates motion planes allowing accurate compositing of planar elements onto moving objects. Planar tracking data can also be used on rotoscope shapes so users don’t have to manually animate motion, perspective, position, scale or rotation of rotoscoped elements. While the planar tracker is a nice addition to Fusion 9, what really struck me is an entirely new camera tracker. Now you can bring in your footage from a moving camera and the camera tracker will analyze it and reconstruct its identical motion path in 3D space and apply it to one of Fusion’s 3D cameras. For those of you who use third party tracking software, this is a major development, and a very useful tool which allows you to composite elements into the original footage while precisely matching its movement and perspective. Fusion will also automatically analyze the shot and calculate the focal length and any lens distortion that might have been on the original footage. Fusion 9 now delivers 3D camera tracking. 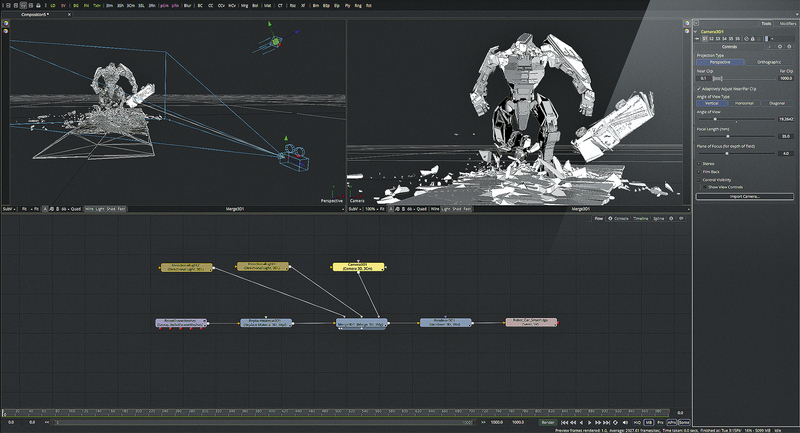 Fusion 9 also features the new delta keyer which brings new image science to Fusion’s keying tools. It features a complete set of matte finesse controls to help you create the cleanest possible keys while preserving fine details in your image. There’s also a new clean plate tool that can smooth out color variations on blue and green screens, making them easier to key. Fusion 9 Studio includes Studio Player, a new application that features a playlist, storyboard and timeline for playing back shots. It can track version history, display annotation notes and has support for LUTs. Studio Player can also output via Blackmagic DeckLink and UltraStudio products so you can view the shots in a suite or theater for review and approval. In addition, you can synchronize the viewing of Studio Players for remote viewing around the world. Another nice thing about Fusion 9 is that allows for unlimited network rendering. That means that large studios working on complex shots and high end visual effects won’t have to pay a license fee for each render node. All you need to do is purchase the Studio version of Fusion (at the very reasonable cost of $299) and then install it on as many render nodes as you need, without any additional charges or maintenance costs. Thanks, Blackmagic! Multiple users can work together from vfx to motion graphics projects. But wait, theres more. Fusion 9 also features more GPU as well as OpenCL acceleration, making it faster than ever. It also works with addition formats and file types such as DNxHR, MXF and others which makes it more flexible as well as more compatible with DaVinci Resolve Files. The price of the Studio Version of Fusion 9 is a very reasonable, if not downright inexpensive (I don’t like the word cheap), price of $299. That’s just been reduced from $995 (for previous versions) and with it, you get access to the pro features. Those who do not want the pro features, can download a free version of Fusion 9 from Blackmagic’s website. $299 for a perpetual license is a good value and once Fusion is purchased, it will keep working forever — even if customers choose to upgrade to a newer version in the future. I, for one, am looking forward to downloading Fusion 9, and trying it out on my next compositing or visual effects project.